This has been an exciting week for me! My daughter gave birth to our first grandbaby! The little (if you could call him that) guy has already become the love of my life. And it has been an even greater gift that God has used this sweet baby to provide opportunity for my daughter and I to bond and, for maybe the first time in our relationship, understand what we mean to one another. But, that will be for another day's blog. Today, God was speaking to my heart, once again, about time. It's almost paradoxical, but time races by so fast, and yet, is all we have to count this side of heaven. Each moment put together makes a lifetime of who we are. So much of the time I share in my blogs how important it is that we use every minute of our time wisely, being careful not to waste a single moment of what we've been given. But tonight, as I held my freshly bathed, sleeping grand baby, I just wanted to soak it all in. I wanted to be right there, in that moment, holding captive the reckless thoughts that abounded in my head, and just be. I wanted to touch his soft, hairy, little shoulder, as his precious head, full of hair, rested knowing that he would be fully taken care of by the one that holds him in her arms. In Ecclesiastes we read that there is a time for everything under heaven. There is not a moment that passes before us that God does not already know about. He knows my tendency to want to be all and do it all, all of the time, all now! I see a website and I want to be a web designer. I see a cool logo and I want to be a graphic designer. Someone enjoys my sewing abilities and I'm ready to jump into sewing projects full force. I do some research on eating healthy and now I want to be a dietitian. Everything I see becomes a possibility for me to take on. I homeschool my children, work a part time job cleaning houses, I'm the Children's Pastor, and somehow manage to care for my kids, husband, and house, all while I do things that I enjoy, like being a blogger. I want it all! But, then I'm reminded that there is a time for everything under heaven. That sweet baby in my arms and that worried, first time mom watching intently to learn what she should do to be a good mom, they need me. They need me to be in that moment. They need me to make them a priority in this moment. And it's a sweet sacrifice; an opportunity only given to me, only given once. So, I lay down all the "good" things that consume my time and energy. I understand that this is where God has me right now. THIS is a time. THIS is a season. I can rest in my Heavenly Father's arms as I take my place right where I belong. For this moment. 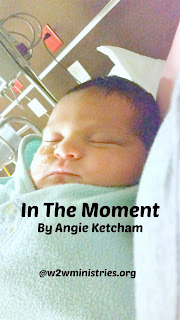 Where is your moment? Have you decided, yet, to lay it all down to be fully into the moment that you've been given? Do you know what that moment is? My daughter will be needing to go to work full time this Fall and has asked me if I would care for the baby while he is young. So, I have some big decisions to make about my future and what moments I'm going to choose to capture. I intend to bathe it in prayer this week. Will you join me? How can I pray for you? What a precious blessing, I'll be bathing you, your family and your decisions in prayer. Congrats on your sweet first grand baby! I cannot believe I missed this beautiful blog! Oh, yes, it certainly made me cry. It hits home with me, how I'd prayed for a mom like figure like you are to your daughter. You are so inspiring and encouraging, and I love that you share the wisdom you're given. God has been speaking a lot to me about seasons and time as well. This has helped me to remember to not just be in that moment for the mundanes of my day but to stay in them and cherish them with a cheerful heart. Because, if nothing else, I have some littles watching me, learning to do what they see me doing, however I'm doing or not doing it. And that is preciously important to me. Thank you for writing and reminding me of the importance of the seemingly small things.